The developers of FLUX:FX aimed to create a truly mobile professional audio tool for musicians, sound designers and studio engineers. 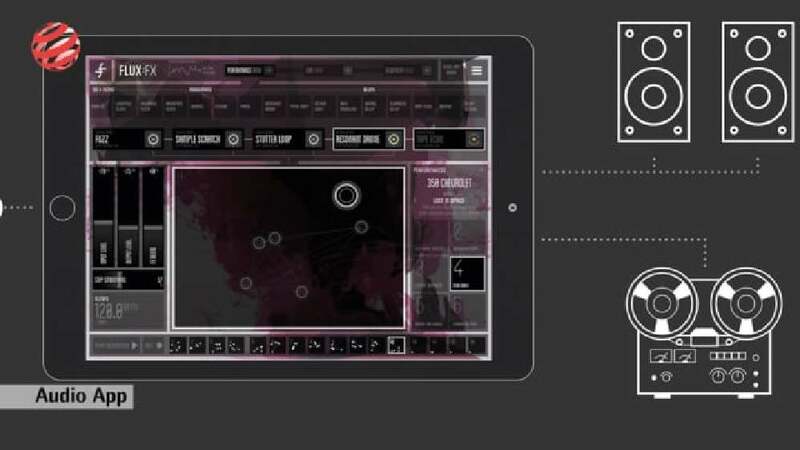 The result is a multi-effect audio processor app for the iPad that lets users “play” their effects. Designed as a native touchscreen digital platform for both studio and live use, the app provides a modular construction box of 31 audio FX blocks that embrace abstract sound design and encourage out-of-the-box creativity instead of simply replicating existing musical equipment. Innovative, intuitive and exciting to use, the app features a minimalist interface with fluid multi-touch controls and a clear focus on usability and touch-based functionality. It lets users manipulate any audio signal or sound source into something entirely new, and thus redefines the possibilities of audio design and live performance in an app with an almost unlimited range of effect options, all processed in real-time. The design of this app succeeds in presenting an extremely complex signal processing flow with its manifold options through a clear structure. By sampling, combining and exploring different sounds and acoustic events, users can fully concentrate on playing and experiencing them in a new context, as the clear typography and symbols of the black-and-white interface do not obstruct the process in any way.